A boxed set of four 1940s films from David Lean is planned for Blu-ray this spring. In an early announcement to retailers, Criterion will be bringing 'David Lean Directs Noël Coward' to Blu-ray on March 27. In the 1940s, the wit of playwright Noël Coward and the craft of filmmaker David Lean melded harmoniously in one of cinema’s greatest writer-director collaborations. With the wartime military drama sensation 'In Which We Serve,' Coward and Lean (along with producing partners Ronald Neame and Anthony Havelock-Allan) embarked on a series of literate, socially engaged, and enormously entertaining pictures that ranged from domestic epic ('This Happy Breed') to whimsical comedy ('Blithe Spirit') to poignant romance ('Brief Encounter'). These films created a lasting testament to Coward’s artistic legacy and introduced Lean’s visionary talents to the world. 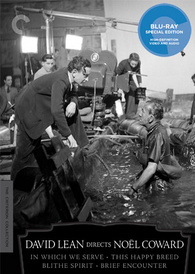 The 4-disc Blu-ray set will feature 1080p video, uncompressed mono soundtracks, and supplements include: Audio commentary on Brief Encounter by film historian Bruce Eder; New interviews with Noël Coward scholar Barry Day on all of the films; Interview with cinematographer-screenwriter-producer Ronald Neame from 2010; Short documentaries from 2000 on the making of In Which We Serve and Brief Encounter; David Lean: A Self Portrait - a 1971 television documentary on Lean's career; Episode of the British television series The Southbank Show from 1992 on the life and career of Coward; Audio recording of a 1969 conversation between Richard Attenborough and Coward at London's National Film Theatre; Trailers; and a booklet featuring essays by Ian Christie, Terrence Rafferty, Farran Nehne, Geoffrey O'Brien, and Kevin Brownlow. Suggested list price for the Blu-ray is $99.95. You can find the latest specs for 'David Lean Directs Noël Coward' linked from our Blu-ray Release Schedule, where it's indexed under March 27.